Welcome to The Old Chapel, brought to you exclusively by Character Cottages, local specialists in stylish Cotswold holiday rentals. The Old Chapel is a former small chapel, located close to the heart of the quintessential Cotswolds village of Northleach. This peaceful village benefits from a number of shops and restaurants, and is perfectly located for exploring the surrounding countryside or visiting the many beautiful towns and villages of the Cotswolds. 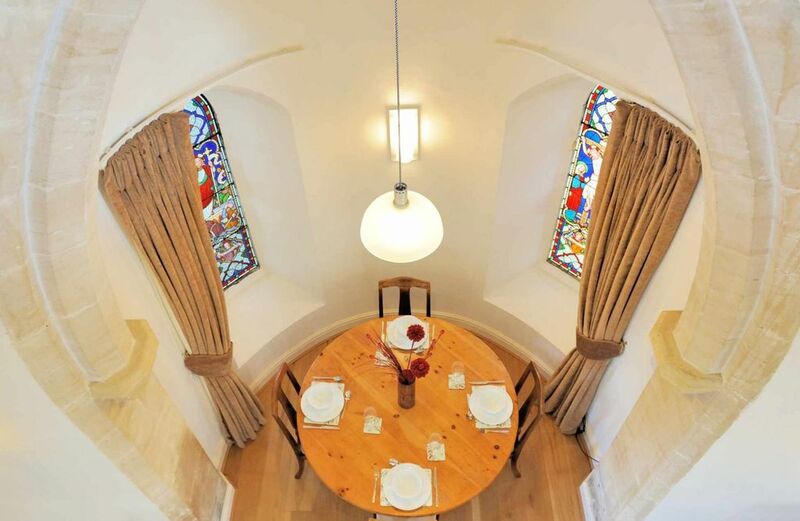 The Grade II listed, detached stone chapel has been beautifully converted, to create a unique and stylish holiday cottage, whilst retaining character features, including stone arches, stained glass windows and vaulted ceilings. The character of The Old Chapel is complemented by its modern facilities, including wireless internet access, a flatscreen TV and a modern kitchen. The property sleeps a maximum of 4+1 people (with the +1 on a chair bed), in two bedrooms, with one bathroom and a downstairs cloakroom. There is an enclosed garden and off-street parking is available. The Old Chapel is an ideal retreat for friends, couples or a family, looking for a peaceful getaway. A security deposit of £175 is payable, which is returned after the letting period, subject to an inspection of the property. The security deposit is payable prior to arrival at the property, via a bank transfer or a valid debit or credit card. Please note that bedroom 2 is an open gallery room, which overlooks the living room of the property - see the "Accessibility, health & safety" section below. The property has free wireless internet access and a Freeview TV with DVD player. A cordless telephone is also provided, with a bar on international calls. Mobile phone reception within the thick walls of the property is poor or variable, however, outside the property it is generally OK. The property has off-street parking for three cars and free, on-street parking is readily available. The drive entrance is relatively narrow and drivers of larger vehicles may prefer to park on the street. The property accepts children of all ages, and a travel cot (without linen) and a high chair are provided. The garden of the property can be enclosed. Please also see the "Accessibility, health & safety" section below. This is an old, Grade II listed property and has many character features, including a narrow and steep spiral staircase and low beams, which could pose difficulty to guests with limited mobility, or carrying babies, both in terms of their general movement and their ability to quickly exit the house in the event of an emergency. Bedroom 2 is an open gallery room, which overlooks the living room of the property, with only a wooden rail enclosing it. We do not recommend that this bedroom is used by young children. The rear patio garden is raised by approximately 50cm and has no railings enclosing it. If you would like to read more about the property’s features, then feel free to get in touch by searching the web for The Old Chapel Character Cottages! Thank you for your lovely review. It's great to hear that you liked The Old Chapel and the small market town of Northleach. This property does have plenty to offer with lots of traditional character and has been beautifully converted from a former small chapel, we would love for you to visit again soon! We enjoyed our stay at The Old Chapel. Even in the heat wave it felt cold which was nice, but must be tough in winter. But it wasn't very cosy and felt very minimal for the price. Hot water is on a timer, which was tough since we were jet lagged and off schedule. There wasn't really any support once we were checked in. We hadn't asked for bedding for the pull out chair when we booked, and there was no way to get an extra sheet. We're used to services such as VBRO offering some sort of support during the stay, but we didn't get that here. The furnishings were ok but again pretty sparse. It would have been nice to have more comfy seating etc. The town of Northleach was charming if a bit minimal compared to other close towns. The Old Chapel is located next door to a community support center, so we were kept up late at night to neighbors animated and wacky conversations. The location is terrific in that it's right off the A40 so easy to get out and about the region from here. It’s lovely to hear that these guests enjoyed their stay, especially so as every member of our team works so hard to exceed the expectation of our guests. It is odd to read about the ‘lack of support’, as there were ten emails, sent and received, during the guests stay. All email responses were sent within 90 minutes, except for those sent after midnight, which, I’m sure, most would find a reasonable time frame. During the booking process for this property, guests are advised of the need to book the requirement of the chair bed; this is because the bed linen has to be requested and collected in advance. Had the guest requested the chair bed at the time of booking, it would have been ready for their arrival. There were two adults and two young children in their party; one king sized, and one double bed prepared for them. They asked for the chair bed a few days after they arrived, for the child who didn’t like sleeping with their sibling. Regrettably, we had no staff available in the area to deliver new bedding at such short notice. Unlike VRBO, where owners typically have only one property to manage, we have many, and this has to be done on a schedule to ensure everything is completed on time. All homes have heating and water on a timed schedule. The hot water at this cottage is on for ten hours a day. Unfortunately, as these guests were jet-lagged, they were trying to shower at midnight, at which point the water heater had turned off. That said, when they let us know, we did explain the schedule, and were told it was fine as it was. Northleach is as described; a typical Cotswold village, quiet and pretty, but with local amenities and easy access to the larger towns. We really enjoyed staying at The Old Chapel! - The garden: there are several loose tiles, a bit dangerous (playing children, elderly, people with mobility problems). That's it! Overall we loved the stay, and would surely recommend it to friends and family! We are delighted that you enjoyed your stay at The Old Chapel. Thank you for bringing these points to our attention. The tap was noticed to be loose before your email arrived, and was fixed immediately. The loose stones in the garden have been secured and the shower treated, so the cottage is good as new. We hope you return again at a future date. This property was well suited for us and the Northleach location was ideal for the hiking vacation we had planned. We enjoyed our vacation but had some issues to contend with. On arrival, the house was cold and adjusting the wall thermostat had no effect. Since there were no directions in the Welcome booklet about this we called the manager. She told us there was an electronic controller in a closet that the cleaning staff leaves in standby mode even though guests are expected. Adjusting this hidden controller warmed the house nicely. We also had some continuing issues with the hot water system. This unit heats the water over night but then doesn’t activate again until either the tank is depleted or its night timer is triggered. This caused us problems since, as hikers, we did not need hot water until we returned in the evening by which time the stored water had cooled off rather significantly. Since this was a newly installed system, this particular quirk was not diagnosed for several days. Fortunately, there is a backup system that can be activated. It is our understanding that information explaining this feature has been added to the Welcome booklet. As just stated, this problem affected our stay for several days. While the management company (CHHM) continued to work with us, ultimately it was the owner of the property who needed to compensate us for our inconvenience. The owner did finally respond to us, but it took him six weeks to do so. The lowered rating we gave this property is due to the property owner’s slow response to our situation. We thoroughly enjoyed our Cotswold vacation despite these problems. The Old Chapel is really a wonderful property in a great location. We spent 6 wonderful nights at this chapel. The village is charming and unspoilt by tourism. This is a perfect base to explore The Cotswolds and make day trips to places a little further afield. The chapel had everything we needed and was comfortable. I would happily stay here again and recommend to friends. We came over from the US specifically to visit the Cotswolds. The old chapel in Northleach was the perfect location. We visited many surrounding towns and villages of Stratford-Upon-Avon, Chipping Campden, Gloucester, etc. Gifford's Circus is a must-see. Sudeley Castle was also a great place to see (Gifford's Circus performed on the grounds of the castle). I now want to move to Northleach. Everyone was so warm and friendly. Due to the spiral staircase I would not recommend this place for young children (5 and younger) or the elderly (unless they want to sleep downstairs on the couch). More seating would be nice...just one additional comfy chair. Car: Northleach is easily accessed by car from all directions, being within a mile of both the A40 and the A429 (Fosse Way), the two major roads through the centre of the Cotswolds. Northleach is approximately ten miles north of Cirencester and nine miles south of Stow-on-the-Wold. Train: The nearest railway station to Northleach is Kingham (approximately 13 miles away), which has regular, direct services to London Paddington, with a typical journey time of approximately 90 minutes. Plane: Birmingham International Airport: 53 miles, approximately 75 minute drive; Heathrow International Airport: 71 miles, approximately 80 minute drive; Bristol International Airport: 61 miles, approximately 80 minute drive.